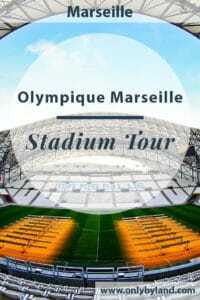 You can buy tickets for the stadium tour online or at the Marseille tourist information office. The tours are given in French language. The guide will explain to you in English when not talking to the group as a whole. The easiest way to get to Marseille stadium is by Metro. I was staying at a hotel in Vieux Port and I took metro line 2 from Noailles to Rond-Point du Prado. Wherever you take the metro from you need to get to Rond-Point du Prado on the red metro line 2. Once you exit the metro station you’ll see the huge stadium. It’s a 5 minute walk to the entrance (above). 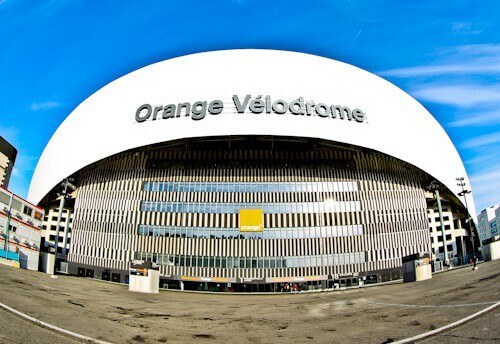 The Orange Velodrome has featured in the 2 World Cups and 2 European Championships. It featured in the France 38 and 98 World Cups and in Euro 84 and 16. It also featured in the Rugby World Cup of 2007. The capacity of the stadium is 67,394. It’s a lot larger than it looks! The highest ever attendance was a match between Marseille and Paris SG. Famous matches held here have been the semi final of Euro 84 where France beat Portugal and went on to win the event. France beat Germany 2-0 here in the semi final of Euro 2016 but went on to lose in the final. After the stadium was modified for the France 98 World Cup a lot of fans complained about it. They complained about the wind and rain which ruined their stadium experience. 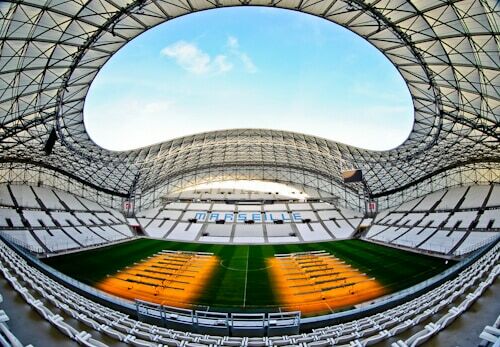 When France won their bid to host Euro 2016, Marseille finally solved the roof problem. 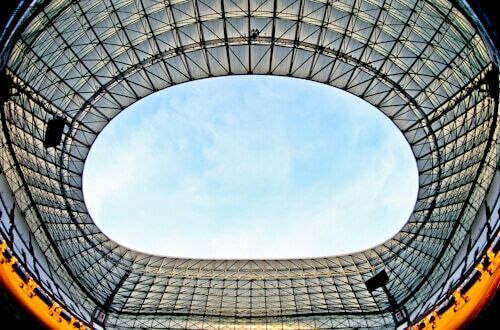 Now fans can enjoy their match day experience with a roof covering the stadium. The roof is an impressive part of the stadium, it also made a visual improvement. The players have an allocated space in the dressing rooms. 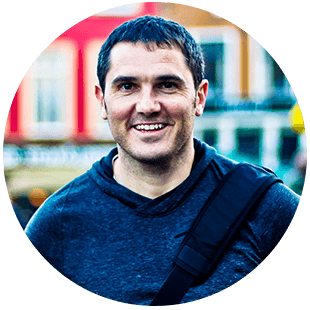 This discourages smaller groups emerging within the team. The manager controls who sits where and which location is best for the team. This means you can sit at your favorite Marseille players locker for a selfie! As well visiting the home team dressing room you’ll see the warm up area, massage tables and bathing area. You will not visit the away team dressing room as part of the tour. I was told that it’s exactly the same as the home team. The only difference being there are neutral colors. The visiting team do not have access to massage tables or warm up area. They do have a small bathing area. As part of the tour you’re welcome to take photos where the famous managers sit during press conferences. 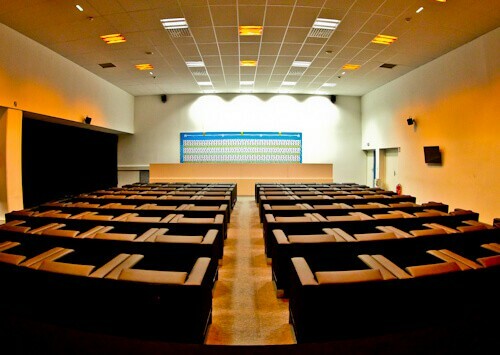 As Marseille have featured regularly in Europe some of the most famous managers in the world have sat here. Patrice Evra, now infamous for his kung fu kick at Marseille has sat here. There will be other people taking the tour who also want their pictures taken. You should enjoy the incredibly comfy seats the journalists get to sit in whilst waiting your turn. After visiting the changing rooms the guide will put the match day music on. You will then walk down the players tunnel just as the players do on match day. The kids will love this part of the tour. It’s another good area to get your Instagram photos of the day. Imagine walking down the tunnel when there are 67,000 fans screaming and booing. At the end of the tour you’re invited to sit in the dug outs. You can take your selfies in the seats where so many famous players and managers have sat. Brazil played here in the France 98 World Cup semi final which means that Brazilian Ronaldo was here. When Portugal played here during Euro 2016, Cristiano Ronaldo was here. You will see murals around the stadium in memory of the greats who have played here. It’s rare that English players move abroad and have success. It’s good to see that Chris Waddle is regarded as a legend in Marseille. He is one of the few English players to be successful abroad. 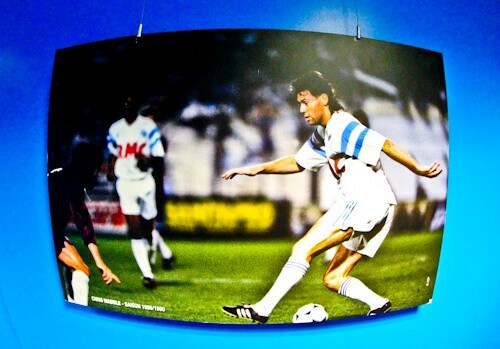 Waddle played alongside French legend Jean-Pierre Papin. Marseille won the Champions League in 1993 a year after Waddle left. Stars such as Fabian Barthez, Rudi Völler and Marcel Desailly played during that campaign. As you exit the tour you have the option to visit the club shop. 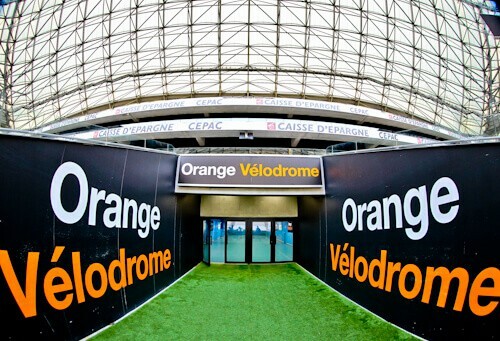 In the club shop you can buy Marseille merchandise to remember your day at the Orange Velodrome. Whilst the guide is explaining to the group in French is your chance to take photos. Then whilst the group are taking there photos you can ask the guide any questions about the tour. The guide will also explain to you what they just explained to the group in French. 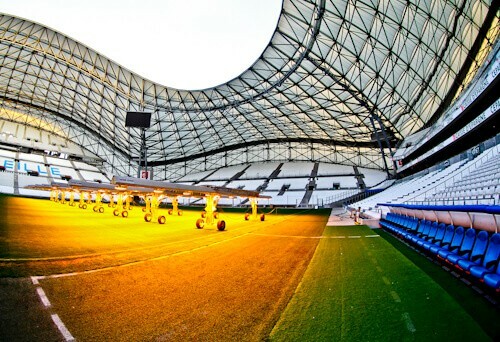 Enjoy your visit to one of the most unique stadiums in the world. Where to stay in Marseille. I always look forward to reading about the stadiums in your post, because it feels like I’ve been here! That’s funny about the visiting team only having a small bathing area, how mean, but I guess it’s part of the psychology! A very cool post, and another to stadium to add to my list! I love the orangey look of the stadium’s pictures. The staudum is such a large one and beautiful at that. I’m no fan of soccer but I’d gladly take selfies with all players’ lockers. It’d be a nice experience having to tour this large space. How cool! I don’t really follow football, but I would definitely enjoy getting to see the behind-the-scenes areas of such a huge stadium. Looks like you had a great time poking around! This seems like a football lover’s dream come true! What a neat experience that really gets you into the mindset of the players. 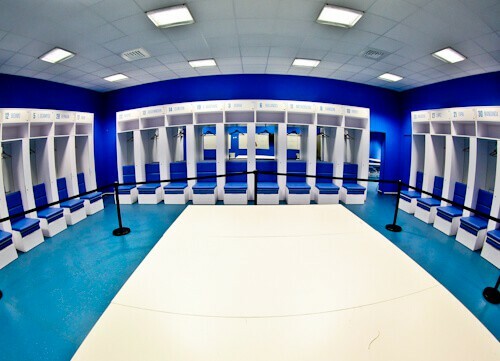 From the dressing rooms to the entrance tunnel, the stadium tour seems to cater to true fans. So fun! I am not a football fan so I would probably not visit stadiums during my trips. However, I guess that it’s quite an important part of a trip for a football fan, especially if they support Olympique de Marseille team. Your photos are great, I love how you’ve captured the entire stadium in one photo. I am not a football fan we play rugby where I am from but great pictures and I actually enjoyed reading about this because it taught me a few things I never knew. Looks like you enjoyed yourself! 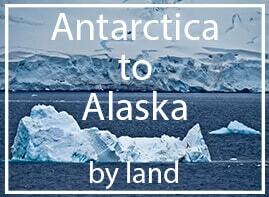 Often times I forego stadium tours, but this might be a tour I might take! I particularly love the press room. I would have loved to cover an event at the stadium as a journalist and relax there. Looks like you had a fabulous trip. Happy travels! I’ve never really been to a stadium before but I felt like I was touring with you the whole time. The way you presented every part of the stadium made me want to look forward to the picture attached. I know you had a nice time there! I’m a huge Marseille fan and was looking to see them play live in the future. I think I’ll plan my visit so I can fit a stadium tour in there as well as I really want that selfie on from the dugout!